The stories vary from dark origin stories for villains we don’t know yet, as well as retelling well-known stories from the villain’s perspective. In general, the unknown villains did better, but several retellings stood out as well. However, I didn’t enjoy nearly as many stories as I should have in an anthology of this length and with this many beloved authors. 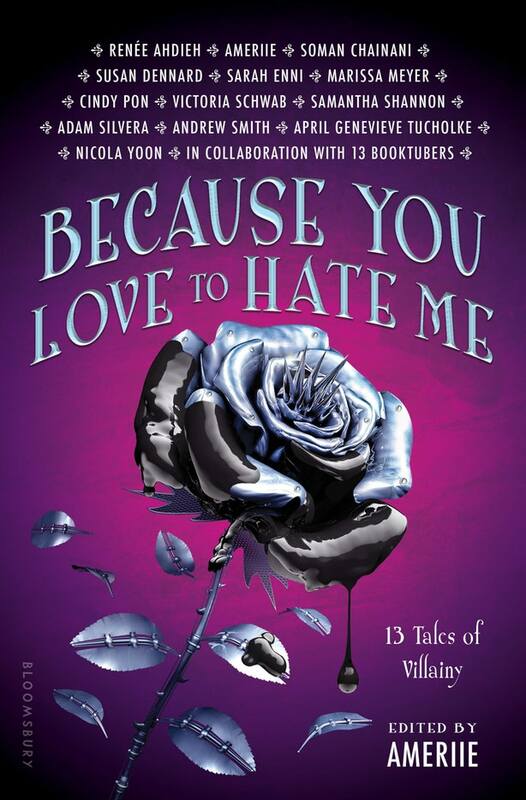 Something that bothered me about this anthology as I was reading all the stories is that there wasn’t really a way to understand what I had read aside from those YouTube book reviewers, called BookTubers, who went on to explain their requests or to riff awkwardly, and repetitively, on the theme of villainy. Stronger editing was required and sorely missed. I also felt the lack of a note to accompany each story. A few stood well without notes, but might have enhanced my enjoyment, others would have greatly improved by an explanation from the author, or a comment from the editor. Even moving each author’s bio beside their story would have been an improvement. Perhaps that’s not as common in anthologies as I believed. Marigold by Samantha Shannon was a delight that interwound popular beliefs about fae in Victorian england with one of my favorite poetic figures in a stunning tale that empowers the female subject of the story. The strength of storytelling here makes me so hopeful for The Bone Season. Death Knell by Victoria Schwab was a fantastic story that stood so well on it’s own, and I dearly hope that fans of Schwab, of psychopomps and darkness seek this one out. The last story in this anthology, Sera by Nicola Yoon, was completely unexpected. I’ve read some of Everything Everything and had nothing bad to say about the style but was not going to read it anyway. To say I was blown away by Sera is not an exaggeration. This story made my jaw-drop and felt like some of the best writing in this book. I still am not quite sure what to make of it. The Blood of Imuriv by Renee Ahdieh was a good start for this anthology, and Ahdieh is almost as beautiful a writer here as in her Wrath & Dawn duology. She’s a master of imagery and characterization, but this felt a little underdeveloped to me, and was the surest sign that I would not be enjoying this anthology as much as I’d hoped. (I also seem to have made a note that some of my enjoyment was tainted by the accompanying text which was oddly unfunny.) This may have also been the only sci-fi story, and I would love to see Ahdieh do more like it. You, You, It’s All About You by Adam Silvera was a refreshingly dark story among some softer punches, but it felt like an origin story that should have led on to a novella or series. The preface to an unconventional hero’s novel, perhaps. The trouble for me with the bulk of these stories, is that they could have used more development, they seemed ambiguous in their evil or their direction. Sarah Enni delighted with her world-building but there seemed to be so much more left to say. Marissa Meyer’s Sea Witch retelling was good but the protagonist was a bit too blind to her flaws, making me worry about how much I’ll enjoy her Lunar Chronicles. There were too many small pieces to enjoy and not enough solidly good stories among those remaining. And if you’re wondering why I haven’t mentioned the BookTuber interludes (for lack of a better name) it’s because most of them aren’t worth mentioning and a few even detracted from the enjoyment of their accompanying stories. Worth reading are Sasha Alsberg’s 411 for Villains which was clever and a good conceit, and The Bad Girls’ Guide to Villainy by Steph Sinclair and Kat Kennedy which was funny and pointed. Kudos for the idea of pairing Authors with BookTubers though, as this greatly helps marketing the book. I think you’re a fan of a specific author, you may want to read their story, but as a whole anthology about villains, I was sorely disappointed. I guess I just wish there had been a little more killing than there was.